How Deep Are Gardenia Roots? It's important to know how deep are gardenia roots before moving, transplanting or planting a new gardenia. Gardenias do not like having their roots disturbed. If you transplant a gardenia in the outdoor garden, be prepared to baby it for several months until it settles into its new location. Gardenias are considered shallow-rooted shrubs. This means their roots spread out and remain close to the surface, rather than grow deep down into the earth. A good comparison is to think of it like a maple tree rather than an oak tree. If you've ever grown a maple tree, you've probably noticed the roots remain very close to the surface; you can see a network of bumpy woody roots near the base of the tree. Conversely, an oak sets root rather straight down, and you won't see as many near the surface. Gardenia's roots aren't noticeable like a maple tree; the important thing to know is that the roots branch out, rather than down, under the soil surface. There's no definite answer to the question, "How deep are gardenia roots?" Six inches? Ten inches? The answer varies with the size of the plant. A mature specimen several feet tall will have deeper roots than a seedling, so there's no one right answer. Learning a plant's growth habit such as how deep the roots grow is important. It can help you successfully grow a gardenia or another shrub. Knowing this simple fact also helps you understand why gardenias cannot tolerate droughts and need constantly moist soil. Plants with shallow root systems tend to need more water, especially surface water. Since the root system of plants drinks in the water and nutrients from the soil, they can only access what they're in contact with. A plant that sends down deep roots can survive droughts better; its roots can tap into moisture far below the surface and withstand longer periods between rain. Not so for the shallow-rooted plant, which needs moist soil. If the soil around the roots dries out, a shallow rooted shrub such as a gardenia experiences great stress and may even die. To prevent the soil from drying out, water frequently. Apply a thick layer of mulch around the plant. Mulch not only keeps water from evaporating but it suppresses weeds, too. If you understand the root structure of the gardenia, you can also use this knowledge to your advantage when transplanting the shrub. To move a gardenia, dig the new hole first. Dig the hole about as wide as the mature shrub and about as deep as the width.Before digging in with your shovel or spade, try a few exploratory pokes around the shrub's perimeter. 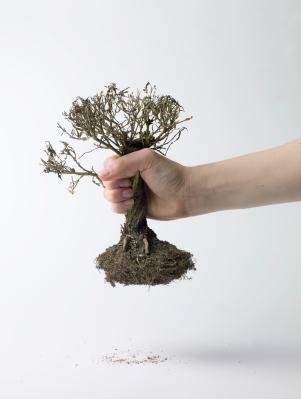 If you hit roots, go out even wider than the shrub itself. The more soil you can dig up around the plant when you transplant it, the less you'll disturb the root system and the happier the plant will be. Very carefully dig around the entire gardenia, then dig down as deeply as you need to in order to dig up the main root system. Bring some of the old soil with you to the new planting hole. Be sure to tamp (press) down the soil around the transplanted gardenia carefully. Water thoroughly, mulch, and water the shrub daily until signs of new growth appear. Lastly, although plant books and articles can estimate the depth of roots, each plant is unique. The root system may vary among plants even within the same species. Dig carefully and note where the roots appear in the soil, and be very gentle when repotting or transplanting gardenias. Give the plant some TLC after moving to baby it through the transition. It may sulk and refuse to bloom the first year after moving it, but if it successfully takes to the new location, it should bounce back.